Sébastien Ogier remained on course for a fifth Rally Guanajuato Mexico victory after recovering the lead following a mad morning in the mountains on Saturday. 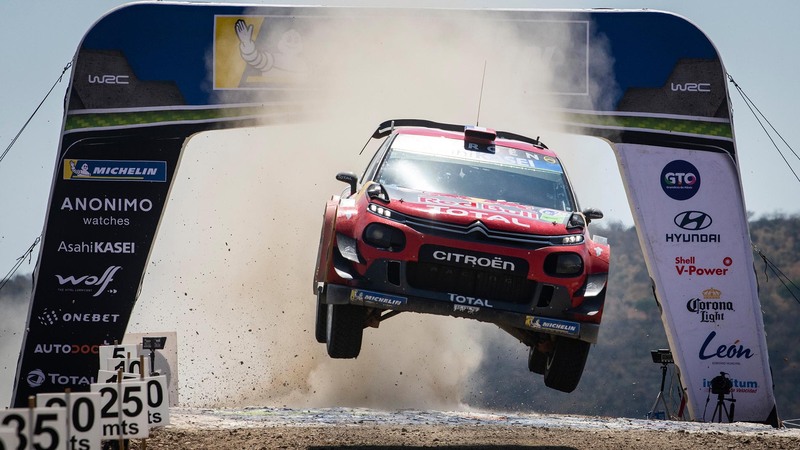 The Citroën C3 driver ended the penultimate leg with a 27.0sec lead over Elfyn Evans as fierce heat and tough gravel roads continued to take a toll on the FIA World Rally Championship contenders. Ogier's overnight advantage was wiped out in a dramatic opening Guanajuatito speed test during the morning. Team-mate Esapekka Lappi slid his C3 into a ditch 800 metres from the finish, coming to rest partially blocking the track. Kris Meeke and Evans squeezed by before organisers curtailed the stage for safety reasons. Notional times were awarded to those behind who did not tackle the entire test competitively. The situation was muddled as Ogier punctured his front right tyre before the stoppage. Organisers awarded him a time 22.4sec slower than Meeke to compensate, promoting the Briton into a 1.3sec lead in his Toyota Yaris. Meeke then suffered a flat tyre in the following Otates stage. He conceded more than 90sec after electing not to stop, and a further 1min 45sec limping through the next El Brinco test with damaged suspension. Ogier was left with a 19.2sec lead over Evans' Ford Fiesta and widened the gap in the afternoon, despite a late scare when he hit the barriers at León's race circuit. "It wasn't a smooth day. First I had a puncture and then it was a long day with hot temperatures. I finished the day with a small issue with the differential and the car was hardly driveable in the final stage," he said. Evans fended off championship leader Ott Tänak by 2.2sec. He was more than 20sec to the good in the morning, but the Estonian closed with two stage wins to set up a thrilling final day. Thierry Neuville was a lonely fourth in his Hyundai i20. The Belgian struggled for speed and spent much of the afternoon tinkering with his car's set-up in the hope of finding a solution. Meeke was more than two minutes adrift in fifth, adding to his woes when he made a similar mistake to Ogier and conceded 45sec. The Ulsterman then tackled the final stage with his car jammed in second gear. He was more than seven minutes clear of WRC2 leader Benito Guerra.